Did you ever see that classic horror movie from a few decades ago where a family decides to go live in this grand, remote building that has a long and mysterious history? The dad, mom, and kid are in high spirits and full of good humor when they drive up in their station wagon, but the building starts to take a toll on them and they slowly descend into madness. They have experiences that can’t be explained and which defy all logic. Eventually, they turn on each other as some invisible force seems destined to take their soul, if not their bodies. Father turns against son and wife, closeness is replaced by distance, relationships are wrecked, and it seems as if the only way out is to pay the ultimate price. Through it all, the building itself seems to be in control. I’m not talking about Stanley Kubrick’s 1980 movie masterpiece The Shining, which was adapted from Stephen King’s 1977 novel. 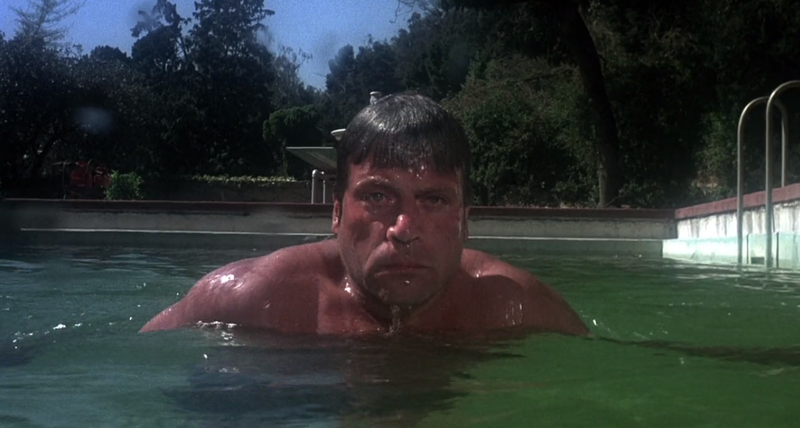 I’m actually talking about 1976’s Burnt Offerings, a movie that feels so similar to The Shining that it seems as if it were copying it outright. But the facts tell a different story, because Burnt Offerings actually came first, before the movie and before King’s book. This story was first published as a novel by author Robert Marasco in 1973. 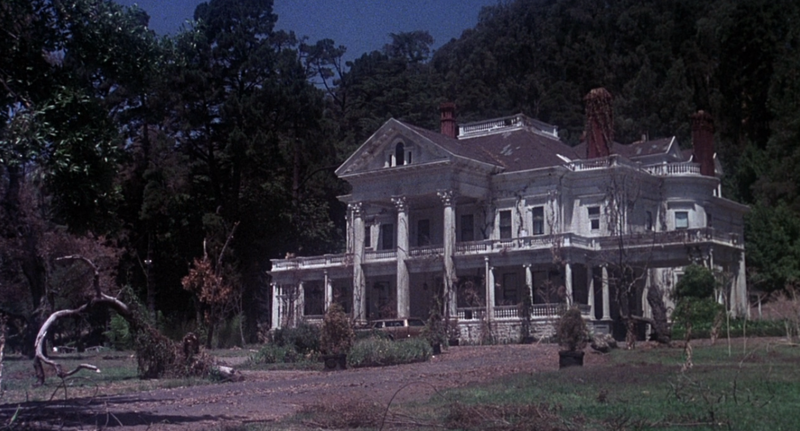 The film adaptation of Burnt Offerings tells the story of a family that has rented a huge, old mansion for a staggeringly-low amount of money by its owners. The residence is overseen by a brother and sister (both in their fifties or sixties) while their elderly mother lives in the attic. When the family agrees to stay at the house, all manner of suspicious activity begins to occur, but nearly all of the drama comes from the characters and their interactions with each other rather than missing spoons or moving chairs. Technically, this is a haunted house story, but the haunting is psychological, not metaphysical. This movie could be a stage play in that there are very few special effects and the story is carried out with only a handful of actors in one location. If I’m being honest, I have to confess that this film is a little bit slow and long for me. 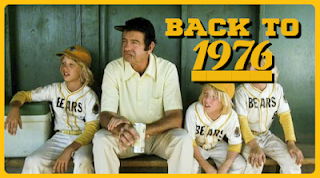 At almost two hours, it moves at a glacial pace that was common for “serious” movies like this one in the seventies but that we’ve gotten a long way from today. I’m convinced that if this movie were remade for modern audiences, it would be produced by Blumhouse and would have a jump scare every eight minutes, and that the movie might be better for it. In comparing it to The Shining (which is impossible not to do), it comes across as a big yawn that has very little story to justify the running time. There are lots of scenes with people sitting around looking moody, or occasionally being mad at each other. It’s like Thanksgiving Dinner in movie form. I was surprised to hear the director state in the commentary that he cut 15 minutes from the first act. Praise be! While there aren’t a lot of actual thrilling elements in this thriller, one of the things that make it worth watching is an outstanding cast. The dad is played by Oliver Reed (The Curse of the Werewolf), an intense one-time leading man who was known more for his “bad boy” lifestyle than his on-screen work. 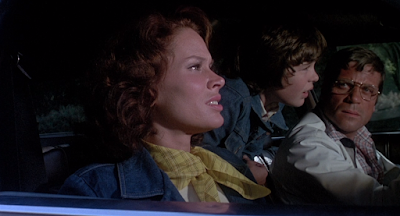 The mom is played by the wonderful Karen Black (Nashville) who thrives in films like this. Their son is played by Lee Montgomery, the little boy from 1972’s rat horror film Ben. Playing the couple’s aged aunt is Bette Davis, star of the silver screen and Hollywood icon. Lastly, in much smaller parts, we’re treated to Burgess Meredith Rocky, Eileen Heckart (Heartbreak Ridge), and Dub Taylor (The Wild Bunch). The cast is really the main reason to watch this movie. Oliver Reed is at all times smoldering, and I’m not just referring to his looks. He seems to be a caged animal, filled with violence waiting to explode outward and consume anything in his vicinity. Karen Black is vulnerable and motherly, but is also cold as ice when the script calls for it. Lastly, Bette Davis is Bette Davis, wonderful and charming in a role that requires her to go from glamorous and beautiful to decrepit over the running time of the film. It’s a brave and notable performance, because Davis is one of Hollywood’s true divas, an icon of a system that was completely the opposite of what this movie requests of her. I associate Davis, with her Transatlantic accent and sense of melodrama, with big performances (if you’ve ever seen 1939’s Dark Victory, you know what I’m talking about). She does get to do some big things in Burnt Offerings, but she gets to play with some subtle nuances that must have been both fun and challenging for someone of her pedigree. She has the biggest transformation of the film and is really wonderful. I often say that these movies from 1976 feel like TV films, but that’s especially true in this case because Burnt Offerings was directed by Dan Curtis, a man who spent almost his entire career constructing stories for television. He created the classic gothic soap opera Dark Shadows, directed the second TV film to feature Kolchak: The Night Stalker with 1973’s The Night Strangler, and worked with Karen Black on 1975’s Trilogy of Terror, which he produced and directed. Burnt Offerings is one of the only things Curtis ever helmed that showed in theaters as opposed to televisions, and it’s apparent. The movie feels small in scope (which isn’t necessarily a bad thing), was shot all on location at the house itself, and filmed from start to finish in 30 days. Because of Dan Curtis’ resume, it makes total sense that this story often feels like a soap opera. He wrings gothic drama from this old, weathered house with a secret, and the running time is filled with character rather than plot. Everything is small in scale, micro instead of macro. As such, this would have been a tough sell to audiences in 1976 who were getting horror flicks like The Omen and Carrie, so it makes sense that this film was met with disinterest by the audiences of the day. 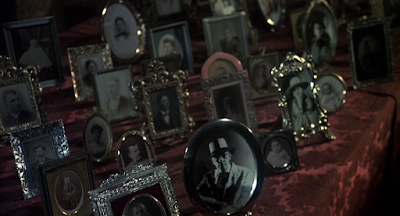 Burnt Offerings is a wonderful showcase for its actors, but it does feel overlong and poorly paced. It would be just another underperforming studio film if not for the Stephen King connection. By the way, there really is no mystery: Stephen King acknowledges his affection for the book and film version of this story and admits that it was a big influence on The Shining. In many ways, The Shining is a much better version of this story, but that’s not to take away from the wonderful work of Oliver Reed, Karen Black, Bette Davis, and Burgess Meredith, who really lend this movie any of the credibility that it has. Burnt Offerings is a movie that feels important, but has very little rewatchability. Every horror and genre movie fan should check it out, but it’s very clear that this story would be done much better a few years later. On that note, it’s an interesting study in filmmaking and style, because we can compare it to The Shining and see how different voices tackle what is essentially an almost identical premise (house versus hotel being the key difference) and still come out with wildly-different results. The Shining is provocative, scary, edgy, and always unsettling. Burnt Offerings isn’t scary at all, and we spend a lot of time waiting for something to happen. There’s no mystery, and the “twist” ending is clear ten minutes into the film. 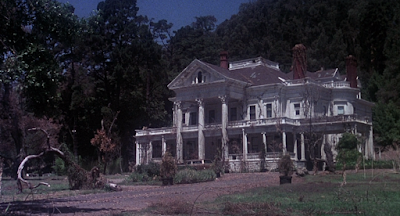 Still, Burnt Offerings is a piece of horror history that was crafted by a man who gave us some important touchstones within the genre. Unfortunately, it will forever be linked to The Shining, a movie that makes the shortcomings of this 1976 film all too clear. so what, Karen Black is the theme of the day? Patrick just posted a commentary on INVADERS FROM MARS (1986), featuring Karen Black. It's serendipity! And I'm not talking about the Cusack/Beckinsale movie. Cool article, and I tend to agree with the points you make. The last minute of the movie makes it worth slogging through, however. It’s sensational. I'd like to add one single thing..
people have pondered the last shot of Kubrick's The Shining for years. What does it mean?? 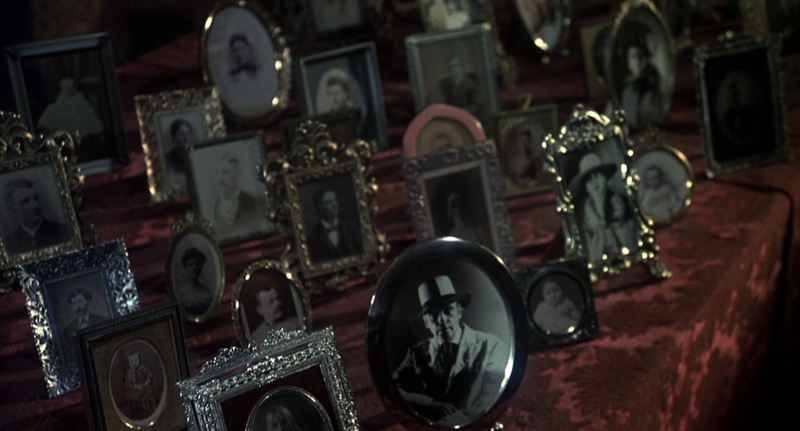 Well, Burnt Offerings feature the exact same ending shot! And it's meaning is blatantly obvious..